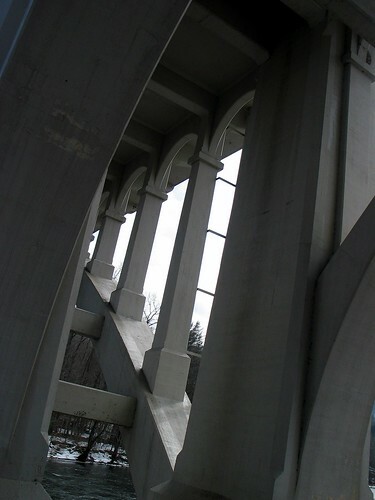 underthebridge2, originally uploaded by jahansell. Did you ever think there would be a structure like this in Sharon? It's the Route 7 bridge over the Housatonic River that leads to Cornwall and Kent. A few more shots of it, here. It's a beautiful piece of architecture but I would imagine you'd get wet feet taking a photo like this! Isn't that a great place to live if I don't pay my bills? Here in Uruguay, when things go wrong we say we're gonna end up living under a bridge... at least this one looks nice. belle perspective et tres belle photo. beautiful prospect and very beautiful photograph. It looks like it's made of very well-crafted wood!